Epicurus (341-270 B.C.) was born in Samos and died in Athens. He studied at Plato's Academy when it was run by Xenocrates. Later, when he joined his family on Colophon, Epicurus studied under Nausiphanes, who introduced him to the philosophy of Democritus. 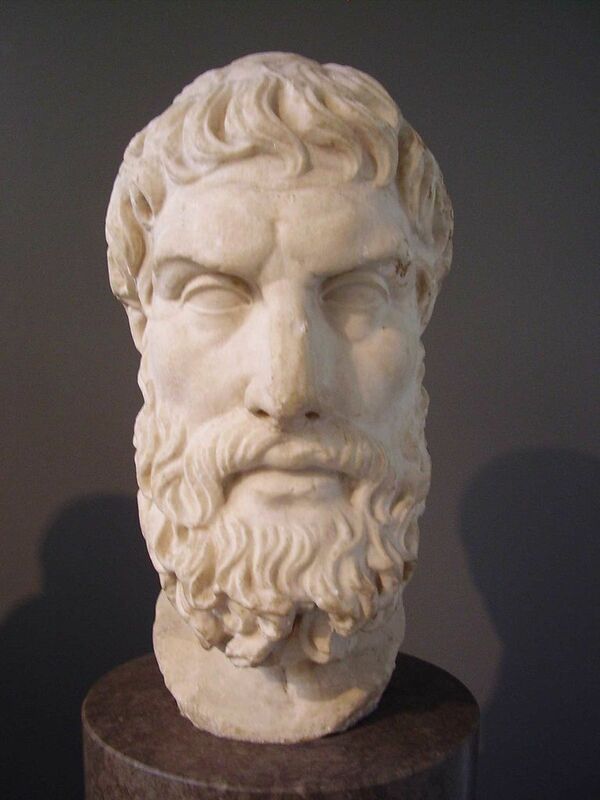 In 306/7 Epicurus bought a house in Athens. It was in its garden that he taught his philosophy. Epicurus and his followers, who included slaves and women, secluded themselves from the life of the city. Epicurus and his philosophy of pleasure have been controversial for over 2000 years. One reason is our tendency to reject pleasure as a moral good. We usually think of charity, compassion, humility, wisdom, honor, justice, and other virtues as morally good, while pleasure is, at best, morally neutral, but for Epicurus, behavior in pursuit of pleasure assured an upright life. "It is impossible to live a pleasant life without living wisely and honorably and justly, and it is impossible to live wisely and honorably and justly without living pleasantly. Whenever any one of these is lacking, when, for instance, the man is not able to live wisely, though he lives honorably and justly, it is impossible for him to live a pleasant life." 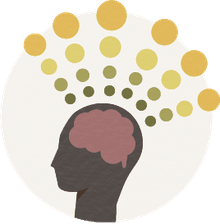 Hedonism (a life devoted to pleasure) is what many of us think of when we hear Epicurus' name, but ataraxia, the experience of optimal, enduring pleasure, is what we should associate with the atomist philosopher. Epicurus says we should not try to increase our pleasure beyond the point of maximum intensity. Think of it in terms of eating. If you're hungry, there's pain. If you eat to fill the hunger, you feel good and are behaving in accordance with Epicureanism. In contrast, if you gorge yourself, you experience pain, again. "The magnitude of pleasure reaches its limit in the removal of all pain. When such pleasure is present, so long as it is uninterrupted, there is no pain either of body or of mind or of both together." According to Dr. J. Chander*, in his course notes on Stoicism and Epicureanism, for Epicurus, extravagance leads to pain, not pleasure. Therefore we should avoid extravagance. Sensual pleasures move us towards ataraxia, which is pleasing in itself. We should not pursue endless stimulation, but rather seek out enduring satiation. "All desires that do not lead to pain when they remain unsatisfied are unnecessary, but the desire is easily got rid of, when the thing desired is difficult to obtain or the desires seem likely to produce harm." According to The Intellectual Development and Spread of Epicureanism+, Epicurus guaranteed the survival of his school (The Garden) in his will. Challenges from competing for Hellenistic philosophies, notably, Stoicism and Skepticism, "spurred Epicureans to develop some of their doctrines in much greater detail, notably their epistemology and some of their ethical theories, especially their theories concerning friendship and virtue." "Stranger, here you will do well to tarry; here our highest good is pleasure. The caretaker of that abode, a kindly host, will be ready for you; he will welcome you with bread, and serve you water also in abundance, with these words: "Have you not been well entertained? This garden does not whet your appetite; but quenches it." In 155 B.C., Athens exported some of its leading philosophers to Rome, where Epicureanism, in particular, offended conservatives like Marcus Porcius Cato. Eventually, however, Epicureanism took root in Rome and can be found in the poets, Vergil (Virgil), Horace, and Lucretius. More recently, Thomas Jefferson was an Epicurean. In his 1819 Letter to William Short, Jefferson points up the shortcomings of other philosophies and the virtues of Epicureanism. The letter also contains a short Syllabus of the doctrines of Epicurus. David John Furley "Epicurus" Who's Who in the Classical World. Ed. Simon Hornblower and Tony Spawforth. Oxford University Press, 2000.